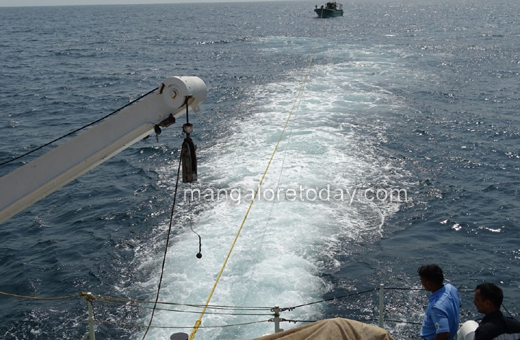 Karwar, May 02, 2018 : Indian Coast Guard Ship C-420 rescued 09 fishermen of fishing boat St Mary (Registration No : IND-TN-15-MM-3793) , stranded 14 NM off Karwar Coast on Tuesday 01 May 18. The boat was stranded from last 02 days due to engine failure and crew was running out of ration and water to save life. ICGS C-420 was on routine patrol in designated patrol area on 1st May 18. At about 1350 Hrs, the ship received message from Coast Guard Headquarters Karwar to investigate and render assistance to adrift fishing boat St Mary. ICGS C-420 swiftly set course towards the stranded boat with full speed, at about 1415Hrs the ship located the stranded boat. The ship carried out primary investigation, it was learnt that the fishing boat was drifting heavily from last 02 days and was running out of ration and water on board. ICGS C-420 Boarding team along with technical crew was launched for detailed investigation and to render any technical assistance required by the Fishing Boat. The Boarding Team established the credentials of the crew, it was found that the boats engine crank shaft was damaged and was not feasible to carry out any repairs at Sea. Further, there was no boat in vicinity, hence towing was the only option for saving the crew. At around 1445hrs the ship took fishing boat under tow and headed towards Karwar port, at around 1645hrs the ship along with fishing boat reached Karwar harbour. All assistance was provided to the fishing boat by Coast Guard for safe arrival at Karwar. ICGS C-420 successfully accomplished Search and Rescue Mission despite adverse weather conditions in area and saved 09 lives along with boat.